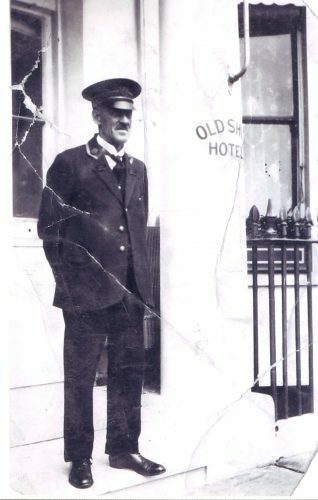 My grandfather,William Alfred Luke, was head porter at the Old Ship Hotel in the early 1900s. He was working there at the time of the 1911 census for about 20 years. 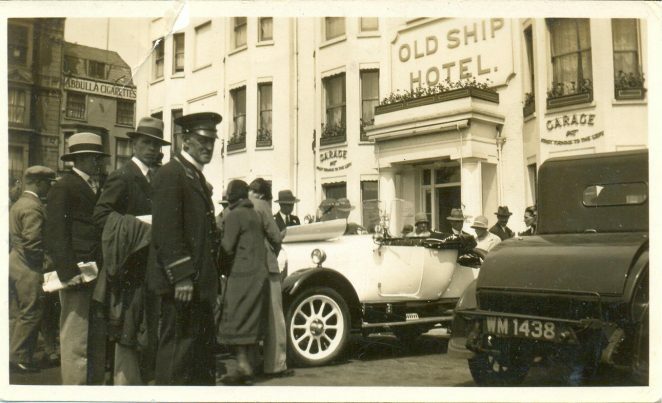 I found these two photos and was amazed at the crowds surrounding a white Rolls Royce (grandad is in the foreground). They even have the bonnet up and are peering into the engine. They wouldn’t be allowed so near it now. Who did the Rolls Royce belong to I wonder? Have you any ideas? Please leave comment below if you can help. Hi Diane, fantastic photos but unfortunately can’t help with the Rolls. My Grandfather also worked there he was also in the 1911 census Alfred Raymond Roland age 16yrs. I’m trying to get a photo of him, we have none. Do you have any group photos, that my mother can look at she may be able to point him out to me. Thank you and kind regards. Good luck with your search. Hi Diane, my grandfather worked there in the 1901 census, my mistake. Even so you might have a group photo at some point between 1901 and 1911. Regards, Susan. Hi Susan. Unfortunately I have no other pictures of ‘The Old Ship’. Have you tried the hotel itself? Sometimes old places have pictures hanging up or in storage somewhere. Hope you find a picture.There are a couple of family trees on ancestry.co.uk with him in (if he was born in Cuckfield) but no photos. Happy hunting! Best wishes. My grandad was a car park attendant here in his later years, the 1950s. I wondered if it would have been inside or out as there’s a garage under cover? He was a cook at The Brighton Union Club on the 1911 census at 138 Kings Road.